Home News Make a date! Final touches to the book are being made and the last couple of fells are having the ultimate sketches completed. 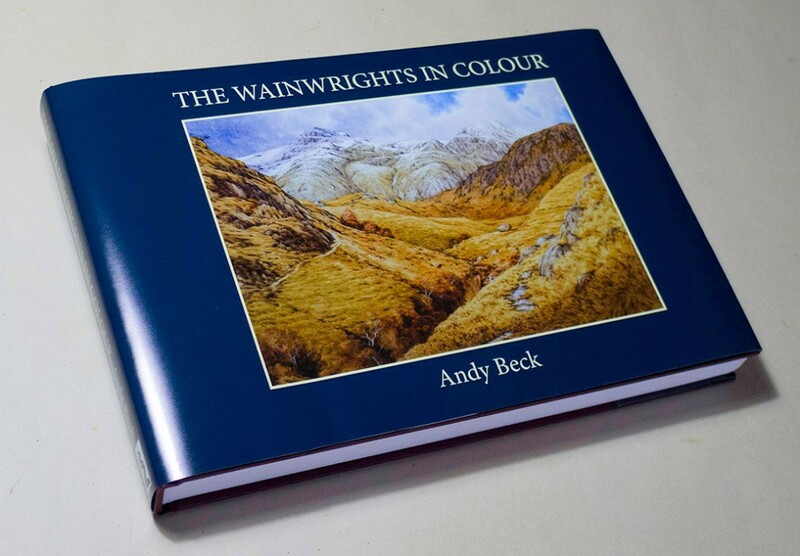 I have made a date commitment and after liaising with the event location for the launch I can now announce that the publication for this long awaited book The Wainwrights in Colour is……. So make a note in your diaries. As many of you will know, 2016 has been a really hard year for me personally and I can only say that I will be pleased to see the back of it. I could have pushed to get the book on the shelves for this Christmas but after all this time I have to produce the book to the highest possible standard, I only get one chance at this. There is no publishing house behind this volume, no marketing or distribution teams, no sponsors. Truly all my own work, not unlike Wainwright himself when he produced the original Pictorial Guides. 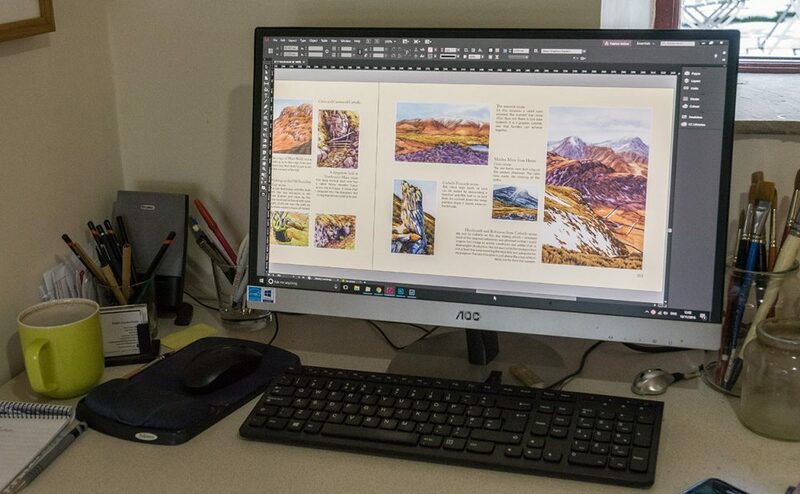 I have designed the book entirely on my own, learning how to do so using a software programme which was entirely new to me, it has been a steep learning curve. Every fell has it’s own page or pages and the sketches are all laid out wherever possible in the sequence that they appear in the Pictorial Guides and to scale, not an easy task with over 1500 sketches. Every sketch has not only a title but the date on which the reference photograph was obtained. 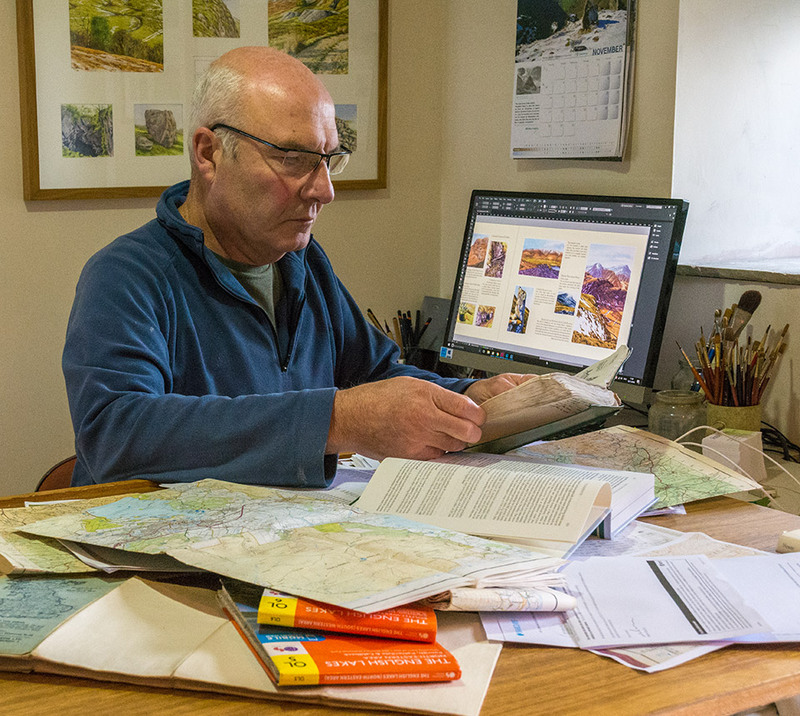 In the design layout there are several spaces which needed filling, this has been done by writing over 40 articles which have some relevance to the work of Wainwright and the Lakeland Fells. I have spent many hours researching subjects and uncovering details, many of which will be new information about Wainwright and his work. I was even tempted to have some sort of “celeb” connected to fellwalking to write a testimonial on the back cover but dropped the idea as surely this unique undertaking has no requirement for a third party endorsement. A new feature in the book is a comprehensive index which has increased the size of the book to 360 pages. When I tell you that this tome now weighs 2.4kg you can perhaps understand why this book has been such a challenge for me. Also included in the book is a 15 minute film on DVD of how the work was undertaken, and still I have kept the retail price to £39.00. The plan is to have March 3rd 2017 as the day that the book becomes available. This will be celebrated by an official LAUNCH WEEKEND on the 3rd to the 5th to be held at The Castle Green Hotel in Kendal (I considered that Kendal was an appropriate location due to it’s connection to Wainwright). The weekend will be in two parts: an “Invite Only” evening on the 3rd with bubbly and canapes which will be for those generous people who supported me by buying an original fell from the series. The numbers for this evening will be strictly limited and ticket only (those who bought fells will be informed in the new year as to how to apply for tickets). The main part of the weekend, Saturday 4th and Sunday 5th will be a “Open” event where I will be showing the film on the project, and signing copies of the book (hopefully). On display will be the few remaining unsold original fells from the project. The times for both days will be posted here early in the new year. If you can’t make this weekend event then early in the new year I will post a form on this website for you to officially pre-order copies and this will ensure that your copy will be delivered to you for the actual launch date of the 3rd March. The Castle Green Hotel at Kendal is a fabulous location to hold this event, it overlooks the delightful town and has views to the fells, not unlike those vistas that Wainwright had from his studio window as he compiled the Pictorial Guides. In the hotel grounds is also a rather nice pub so no doubt this may get some use by me over the weekend either to celebrate or drown my sorrows. The hotel is offering generous discounts on rooms to anyone who may wish to make a weekend of it, after all, not only the book launch but also handy for the shops of Kendal and the nearby fells. I should warn you, it is a busy hotel so don’t leave it too long to book and mention the book launch when doing so. If you wish to be kept up to date with further news about the book then do subscribe to this website using the form on the right. You will receive updates into your inbox as they happen. Thank you for reading, hopefully I will see you early in March. Trust me, no one is more excited about this news than yours truly! UPDATE. Today I sent an email link to all those who so far have registered interest in obtaining a copy of the book. If you have not received an email then either your details have changed, the email has gone to your junk mail folder or you are not registered on my list. Email me at the address above to ensure you are down for a copy.